This world is full of strange happenings. Some of the times they appear in open. But most of the times these remain hidden. Don’t believe us? Read for yourselves. The unique photograph was captured by the staff of Kentucky Department of Fish and Wildlife Resources. The picture was then uploaded on their Facebook page. Such a unique picture deserves such sort of treatment only. Needles to say, it exploded on the social scene. As of now, the image has been shared 4327 times. Well, one more share coming up. But what is the story behind this? Apart from its own head, another head was attached to. The first one was in a normal state. The other head was decomposing. The decomposed head was tangled and dangling to the fresh head’s antlers. A close investigation of the decomposed head showed that it was that of a different buck’s. According to the Thursday Post it’s unclear what circumstances led up to this buck’s carrying around the severed head of a decomposing carcass. An accurate or legible explanation cannot be deduced from the incident. Regardless, this has been labeled as a true harvest by the Thursday post. Such instances are incredibly rare and compel wildlife experts to broaden their horizons about animal behavior. Hunter Bob Long was indeed pleasured for the instant fame his catch had delivered. He is a resident of Marshall County, Kentucky. Sgt. 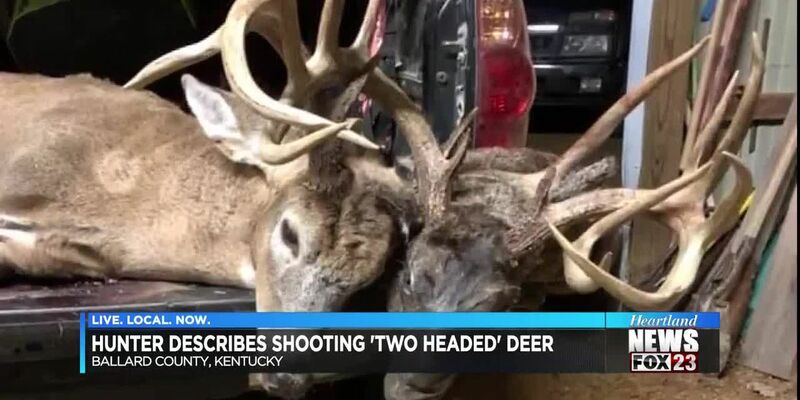 Tony Dunker, an employee of Kentucky Fish and Wildlife suspects that the decaying head belonged to a deer who had been dead for weeks, after locking antlers in a fight with the other buck. Sgt. Dunker suspects, these were two alpha males who were slugging it out for the control of a specific territory. But he also does not rule out the possibility of the fight happening for mating with a prospective female. The spot where the deer was shot is located?in far western Kentucky where Illinois and Missouri meet, about 30 miles southeast of Cape Girardeau. How Did The Decomposed Buck Die In The First Place? After stating the evident reasons for such a brutal encounter, Dunker thinks that one of the bucks must have died on spot, due to severe head trauma. The other buck might have carried the carcass for days altogether. Slowly, its body decayed to the point where the head came loose. Residents in the area previously had spotted the buck alive with the decaying head in its antlers and taken pictures.